Dyno Night. July 24th, 2010, 6PM until!! $40 for 3 Pulls, Wideband $10!! Hamburgers, Hotdogs and Wings on site!! Customer must purchase Wideband to be entered into the "Worst Tune" contest. 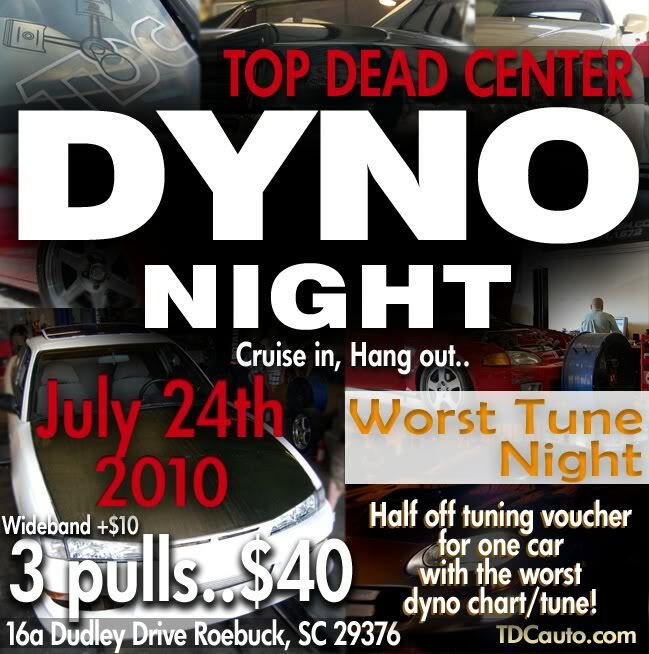 TDC will choose one car at the end of dyno night, based on wideband readings, and appearance of the dyno chart. The car with the "worst tune" will be awarded with a voucher for half off the price of a normal tune (a $175 - $300 value). Awarded voucher must be redeemed within 30 days. Winning customer is responsible for purchasing and installing any needed tuning hardware. Worst Tune Contest is open to all vehicles, Import and Domestic. Entered cars can be previously tuned, mods changed, stock cars etc. No requirements to enter the contest. Bump. This Saturday. See you guys there.